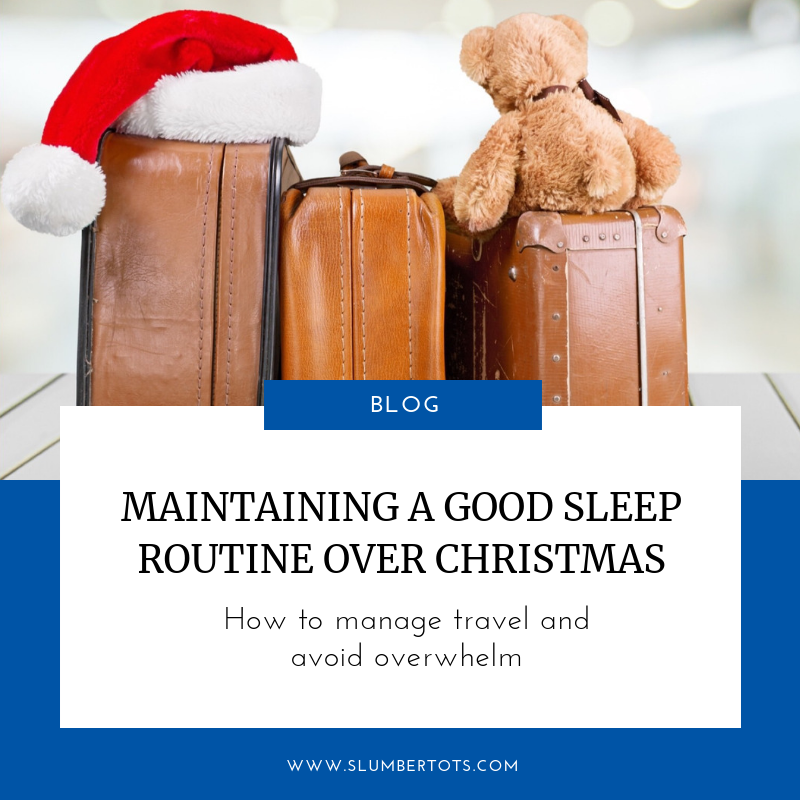 It can be challenging to manage sleep and travel at Chistmas. Many parents who have recently worked on their baby’s sleep are worried that they might regress a little over the festive period. Between the travel, the excitement, the constant attention and then travel all over again, it’s easy to see how things can get off track over Christmas. There are two major impediments to your little one’s sleep over the festive season. One is travel and the other is family and friends, so I just want to tackle both of those topics individually. If you’re thinking about making some changes to try and improve your little one’s sleep, but you’ve got to take a trip in a few weeks, my suggestion is to put it off until you get back. If you’ve already started, not to worry. Going away typically won’t help your little one sleep better. But if you can maintain some semblance of normality until the end of your trip, you and baby should be ready to get back to it when you get home. If you’re driving to your destination, a clever trick is to schedule your driving time over baby’s naps. Car naps aren’t ideal, but compared to no naps at all, they’re the lesser of two evils by a mile. So if at all possible, get on the road right around the time that your baby would normally be taking their first nap. Weather permitting, you might even look for some parks or tourist attractions. If it’s too cold then try for indoor activities (soft play, anyone?) along your route where you can stop when your baby gets up. It’s a great chance for everyone to stretch their legs, which will make that next nap that much easier. If you’re flying, well, it’s always a bit of pot luck, in my experience. It’s no secret that planes and babies just don’t seem to like each other> So I suggest (and this is the only time you’ll hear me say this) that you do whatever gets you through the flight with minimal fuss. Hand out snacks, let them play with your phone, whatever it takes (within reason) to keep them calm. The truth is, if they don’t want to sleep on the plane, they’re just not going to, so don’t try to force it. It will just result in a lot of frustration for both of you (and, most likely, the passengers around you). Once you’ve arrived at your destination, take a minute to congratulate yourself on surviving the journey. Because in the car or on the plane, everybody is on your side, right? Keeping baby quiet, relaxed, and hopefully asleep, is just what everyone is rooting for. However, now that you’re at Grandma and Grandad’s house, it’s just the opposite. Everyone wants baby awake so they can see them, play with them, take a thousand pictures, and get them overstimulated. It’s exceptionally difficult to tell all of these friends and family members that you’re putting an end to the fun because baby needs to get to sleep. So if you need permission to be the bad guy, I’m giving it to you! Don’t negotiate, don’t make exceptions, and don’t feel bad about it. Firmly explain to anyone who’s giving you the “I’ll just sneak in a take a quick peek,” routine that your baby needs to sleep and you’re not taking any chances of them waking up. Let them know when baby will be getting up and tell them to wait, come back, or catch you the next time. Or better yet, tell people in advance when to expect some baby time based on your baby’s naps. I know it sounds harsh, but the alternative is an almost immediate backslide into disturbed and inconsistent sleep. Baby misses a nap, gets all fired up because of all the new faces and activity, then overtiredness kicks in. Then cortisol production goes up, and the next nap is ruined, resulting in more overtiredness, and derailing nighttime sleep. Before you know it, you’re headed home and it seems like baby did nothing but cry the entire trip. It can really happen that quickly. So, you’ve managed to navigate the daytime, and let everyone know you’re not budging on baby’s routine. She took her naps at the right times, and now it’s time for bed. The only catch is that, with all of the relatives staying at the house, there’s only one room for you and baby. And you think to yourself, bed sharing for a few nights isn’t the end of the world, is it? I wish it was that easy, but again, you want to make this as little of a deviation from the normal routine as possible. Babies can develop a real affinity for co-sleeping in as little as one night. So how do I manage room sharing with my baby? So this may sound a little unorthodox, but if you’re sharing a room, make it into two rooms. I’m not saying you need to bust out the plasterboard. But I do suggest hanging a blanket or setting up a dressing screen. Anything that will safely make a partition. You might also be tempted to use a dummy or rock to sleep if settling is challenging. Unfortunately, your baby is going to latch on to that really, really quickly. If you do that, chances are you’ll be waking up every hour or two, rocking baby back to sleep or putting her dummy back. Which is going to end up disturbing everyone a lot more than a bit of crying at 7pm. On a serious note, I find the biggest reason parents give in on these points is because they’re embarrassed. There’s a house full of eyes and they’re all focused on the new baby, and by association, the new parent. The feeling that everyone is making judgments about how you’re parenting is nearly overwhelming in these family gatherings. But in those moments, remember what’s really important here. Your baby, your family, and their health and well being. There may be a few people who feel jaded because you put baby to bed as they arrived. And your mother might tell you that constructing a partition is ridiculous. But remember you’re doing this for a very good reason. And remember, if you need any help getting things on track, then I’m always here to support you.